Join Us for the Make AT for All Conference and Expo! The AT Makers’ Fair will inspire participants to become creative problem solvers, bringing together makers of all abilities to share ideas, develop new skills and enhance innovations for persons with disabilities. The Fair will empower individuals with the methods, materials and know-how needed to efficiently create everyday just-in-time devices and technologies. Join us! Novice to veteran makers of all ages and abilities are welcome. Dr. Therese Willkomm appeared on the Assistive Technology Update Podcast hosted by the INDATA project. She spoke about the AT Makers Fair. Listen to the podcast or download the podcast. Please Follow and Like our Facebook page for frequent updates about our partners, presenters and plans for the day. 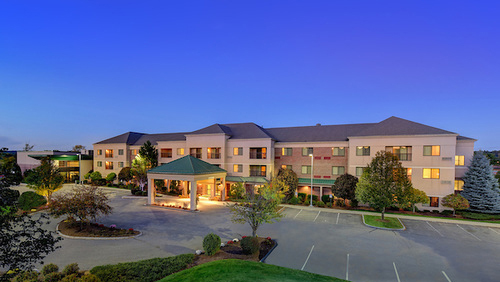 A limited number of rooms have been reserved at the The Courtyard by Marriott, which is adjacent to the Grappone Conference Center, for $169 per night. To book your room online, visit this reservation link. Make your reservation via the phone by calling 603-225-0303. Use the code INDC. Deadline for the group rate is September 7, 2018. Driving directions from Manchester Airport: Take I-293 North to I-93 North. Take exit 15 West (N. Main St.) Take first right at flashing lights onto Commercial Street. Follow 1/4 mile to Constitution Ave. The conference will kick off with two AT Talks by Therese Willkomm and Bill Binko, inspiring AT maker movement leaders. 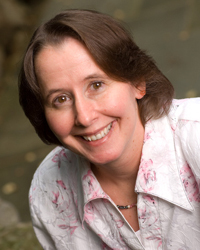 Therese Willkomm is known nationally & internationally as “The MacGyver of Assistive Technology" and is the author of 22 publications including Assistive Technology Solutions in Minutes II: Ordinary Items, Extraordinary Solutions. She is currently the Director of the New Hampshire Statewide Assistive Technology Program (ATinNH) with the Institute on Disability and a Clinical Associate Professor in the Department of Occupational Therapy. She has been engaged in providing/managing assistive technology services for over 30 years in the areas of home, school, and worksite modifications for persons with disabilities. Bill Binko is founder of ATMakers.org, a non-profit organization focused on introducing Makers and Assistive Technology users and give these two communities the tools they need to collaborate. Bill is also the co-founder of LessonPix.com, an online tool for teachers and specialists working with the special needs community. 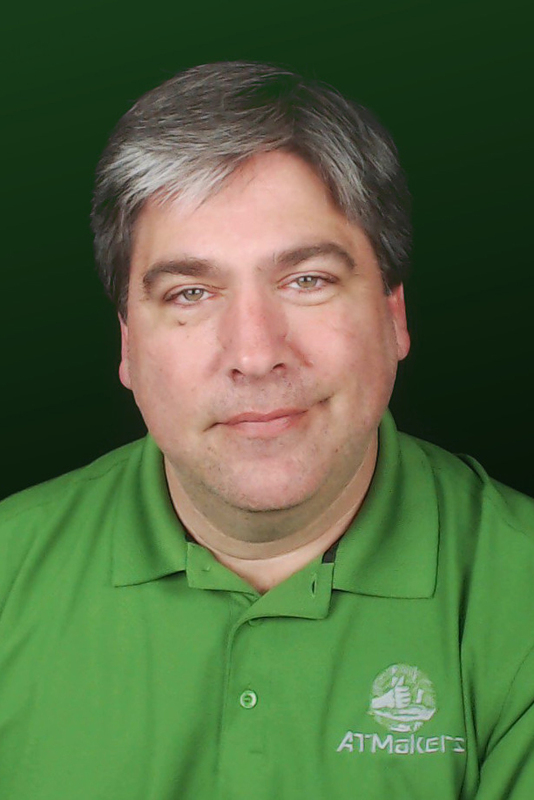 Prior to joining the AT and SPED communities, he spent over 20 years working as an engineer for Fortune 500 companies as a consultant for Perot Systems, Dell, and Tribridge. This combination has left him with a unique perspective of both the Maker and AT worlds and the incredible opportunities to collaborate. Come to the Make AT Café and learn to quickly create your own multi-use AT solutions! Create and take home, 10+ AT devices, valued at $500+, if purchased commercially. Acquire new skills in using various tools and materials. Network and learn with AT makers throughout North America. Attention all makers, inventors, tinkerers, and creators of contraptions, gizmos, and gadgets, come share your ideas to help individuals with disabilities overcome everyday challenges. Tinkerers and makers are changing the world and making dreams come true every day for individuals with disabilities. 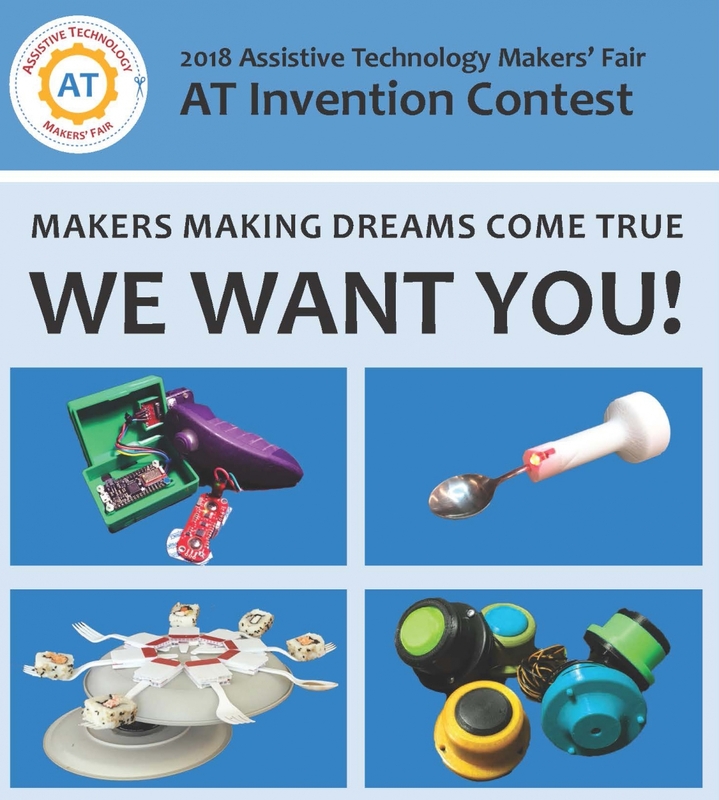 Come exhibit your invention at the Assistive Technology Invention Contest during the AT Makers' Fair and compete to be the 2018 Maker of the Year. Fair attendees will vote for their favorite inventions and the top three makers will be awarded prizes. All levels of experience are welcome! Download the Invention Contest Flyer. At the Assistive Technology Makers’ Fair participants will choose from 25 sessions in five strands to increase their knowledge and skills around creating assistive technology for all users. Conducted by presenters around North America, participants will select their choice of workshops from these strands. Through discussion and demonstration, participants will learn how various toys can be adapted for use with different switches. Learn methods, materials and resources for switch adapting complex toys when a simple battery interrupter will not work. Discover tips and tricks for soldering and securing connections. "Once you learn to read, you will be forever free." -Fredrick Douglas. Bring your favorite book to be adapted in this hands-on session. Attendees will be exposed to over 100 hacks to meet a variety of access needs from the Dollar Store, Home Depot, and junk drawer. Simple adaptations can increase durability, facilitate page turning, improve visual access, and adapt for language. STEM-based coursework can be daunting and difficult to complete independently for individuals with disabilities, particularly when emphasis on language, data visualization, and/or imagery to depict complex concepts and structures is pervasive. UMass Amherst is addressing this through interprofessional collaboration in the areas of Assistive Technology/Accessibility, Molecular Biology, and 3D Printing. Learn about intellectual property fundamentals and entrepreneurship and how it relates to your innovations! Our presenters will provide information on how intellectual property can be protected, present an overview of entrepreneurship foundations, and discuss community resources to support your innovative ideas. Learn to use cardboard to create inclusive community in unexpected ways -reciprocal impact through community engagement. The speakers will share their roadmap, strategies and plans for the future in the hopes that attendees can take some ideas back to their communities to germinate their own collaborative projects. With Book Creator, teachers and students can create learning materials, show knowledge, collaborate in real time, and use a variety of means of expression. This versatile app and online tool is easy enough for a preschooler to use, yet sophisticated enough to provide a range of assistive technology supports across diverse ages and challenges. This session will introduce participants to key features and uses of this exciting tool. This presentation will explain the iterative design process as it is applied to designing assistive technology devices. Examples will be given of how it has been successfully used to design assistive devices. Dedicated speech generating devices and iPad apps used for communication can be challenging for individuals who experience physical impairments. This session will discuss and demonstrate how to create access solutions for communication devices. This includes low-tech iPad/AAC mounting solutions; non-conductive mitts; key guards; and stylus adapters. The Commercialization Pathway will discuss the unique commercialization barriers assistive technology innovators face and provide an overview of the TREAT Commercialization Methodology, which provides a comprehensive product development pathway focused on efficiency, risk assessment, and successful outcomes. This workshop will familiarize participants with the GoBabyGo! program in New Hampshire. After a brief introduction to the program, participants will utilize tools and materials to brainstorm, design and construct a support system for a child’s small format electric vehicle. Upon the competition of the GoBabyGo! build, a discussion will take place on the process and the future of the project. Come see various AT solutions for those with limited to no use of their upper extremities. Learn how these solutions can be easily made with inexpensive materials in minutes. Learn about pieces of adaptive sports equipment used at Northeast Passage, and some common modifications that have been made for participants. Take a hands-on approach and try some of the equipment and see some of the high-tech and low-tech adaptations in action. Learn how to apply emerging practices of design thinking to bring innovation to the market and sustainable revenue to the modern nonprofit. This session will discuss and demonstrate over 20 devices/adaptations that can be made in minutes to accommodate for low vision or blindness. This includes tactile graphics overlays for the iPad and books; adaptions that can be made to appliances in the home; how to create portable scan and read stations and more. This workshop will discuss and demonstrate how 10 different plastics, you might not even know about, can be used for making countless assistive technology solutions in minutes. Participants will learn the best situations to utilize plastics such as, Corroplast, PVC, Corner Guard and more to fabricate solutions and gain the knowledge needed to create their own solutions. Learn how to engage your local school’s STEM clubs and robotics teams to create custom AT solutions. See how this collaboration rewards both the teens in these organizations as well as the AT community. Making assistive technology (AT) can be complicated and expensive - but it does not have to be. This presentation will cover some of the latest manufacturing technologies that can be used to create AT, as well as low-tech tools and techniques that can be used to create effective and affordable AT solutions. This session will discuss and demonstrate over 20 different assistive technology solutions that can be made to accommodate for various cognitive challenges. These solutions include: using color coding in innovative ways, making jigs and fixtures, creating mounting solutions for iPads for video modeling or photo cookbooks, implementing low-tech reminder solutions, and more. This workshop will discuss and demonstrate how to use 15 different specialty tapes for making a multitude of assistive technology solutions in minutes. Each tape is used for varying project types. Participants will learn the best situations to utilize which tapes for fabricating which solutions and gain the knowledge needed to create their own solutions. Real life examples illustrate the outputs of an initiative called fabricATe demonstrating the effectiveness of a community maker-movement approach that provides young children with quick access to low/light tech assistive tools. Leave this session with inspiration for and very practical information about starting a similar initiative in your community. When off the shelf isn't good enough or doesn't exist, it's time to get creative. Learn what free software is available and what digital fabrication tools are useful in making custom assistive technology solutions. Disability professionals may need help in making the appropriate assistive device. Explore how to find good existing projects and good community volunteers to bring solutions and ideas to life. This session will discuss and demonstrate over ten devices/adaptations that can be made in minutes to accommodate for a hearing loss. These include: sound amplification system; sounded enhancer for an iPad; low-tech ways of making an alarm clock louder; creating a virtual interpreter stand, and more. Come learn how the New Jersey AT Act Project partnered with local school districts to create Raspberry Pi Assistive Technology solutions in order to increase independence for residents across NJ. Staff also collaborated to raise awareness in local schools about people with disabilities and the power of AT. In the Boston Public Schools, the instructional and assistive technology departments have been collaborating on Make&Take, a monthly professional learning community that takes a project-based approach to designing tools for diverse learners. This discussion will focus on how the presenters established a cross-disciplinary professional learning community and ways for you to create your own. The presenters will also share a sample project for you to bring back to your district. The AT Makers’ Fair will inspire individuals to become creative problem solvers by empowering them with the methods, materials, and resources needed to efficiently create every day solutions. 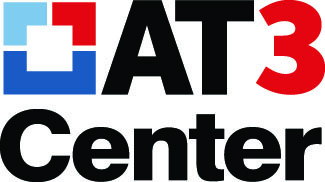 The conference and expo supports just in time technology device delivery through rapid fabrication and device deployment techniques, inspiring all generations to develop innovative skills and enhance emerging technologies. Demonstrate your commitment to assistive technology innovation with an AT Makers’ Fair Sponsorship. You can download a copy of the prospectus and register to become a sponsor. 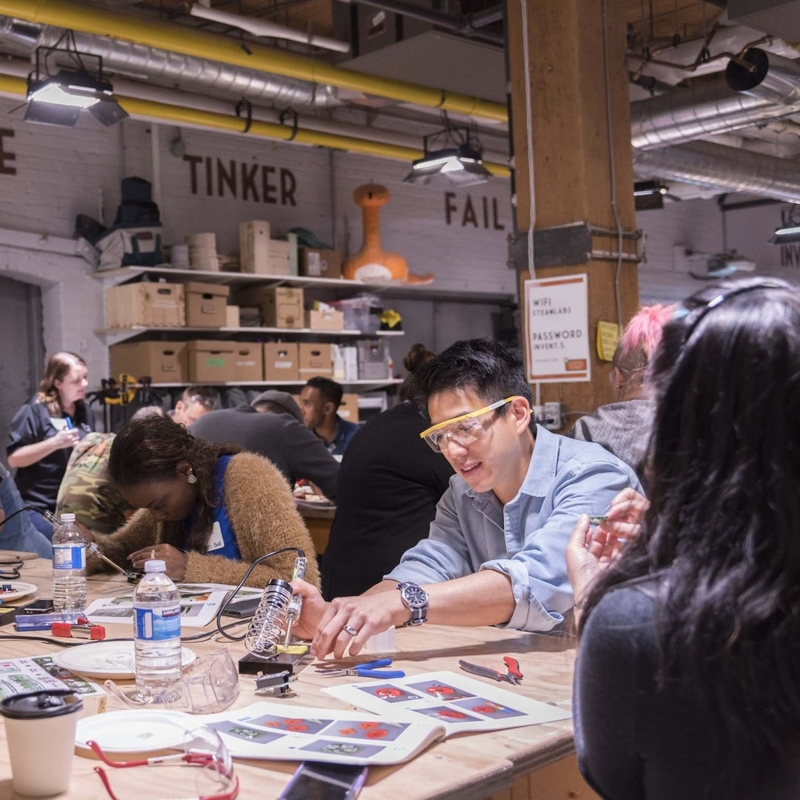 Participants will learn to build amazing assistive technology solutions in minutes using various plastics, adhesives, and fasteners at an assortment of maker stations in the Make AT Café. The Café will be a place where people can eat, drink, create, socialize, network, and learn from one another. This contest will allow makers of innovative assistive technology, that have the potential for commercialization, to display their innovation to our national audience. This event will be exhibited all day in the main hallway. Attendees will vote on the best adaptive contraption and inventors will receive special recognition and awards at the end of the day. Program advertisements are full color and printed on 8.5” x 11” paper. Are you interested in making an in-kind donation or getting involved through a blend of in-kind and monetary support? We would love to talk to you! Please contact Stacy Driscoll (at.makers@unh.edu). We are pleased to have a variety of collaborative companions who are excited about being a part of the Assistive Technology Makers’ Fair. Our companions support our mission to bring together makers’ of all abilities to create just-in-time devices and technologies. Includes access to the conference, fabrication of 5 multi-use devices, lunch, refreshments, and CEU’s. Continuing Education Units are available for NHOTA. NH-ASHA, and RESNA. Registration closes September 23, 2018.